Check them out below (via GallowBoob on r/lego) or in his gallery over here. Witnesssssss! 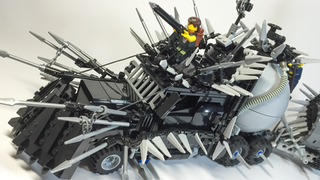 Here’s a giant truck, full of spikes and an extra fuel pod, inspired by Furiosa’s War Rig. Here’s the Gigahorse, Immortan Joe’s slightly modified 1959 Caddilac. It’s also a slightly modified Ghostbusters Ecto-1. Here’s the most insane member of Immortan Joe’s party: The morale booster Doof Wagon. And here’s a bonus from a different builder. A fantastic remake of the “Elvis” hotrod by Calin.